There are hundreds of articles, blogs and information about what it’s like to be, and support for, an accompanying spouse in London. Mostly, they focus on females as the accompanying partner, but we’ve noticed a growing trend for men to be the ‘trailing spouse’ and not a lot of information on the subject. Relocation to London is a great opportunity as well as an exciting adventure; it can also be a challenge if you’re one of the many partners or spouses that have relocated to London. If you’re moving to London as part of a relocation jobs secondment then you will be settled in no time. Many companies use London relocation agents to settle their employees. After you’ve fixed the drapes and unpacked your belongings you’ll want to find something to do with your time. Many blogs list associations and groups that partners can join to enable them to get out of the home, and have the chance to make new friends. Far too often the major listings are for women’s groups and associations. What if you’re not a wife or girlfriend? Are there any clubs that cater to men who have followed their partners across the ocean to make a new life in London? If joining the DAR in London is not really your tipple then we’ve prepared a list of great associations for guys moving to London. Casual, fun, informative and even sporty. We’re talking about men getting together to share experiences of being an expat, exploring the city and settling in as fast as possible. While it is true that most accompanying partners are women, at London Relocation Services we like to provide a full relocation to London package. The American Expats in London is a great place to start if you’re an accompanying spouse in London. They hold regular meetups and offer advice to families and partners on how to really enjoy London. The Expat Partner’s Survival Guide also has a number of resources for men who have joined their partners or wives in London. 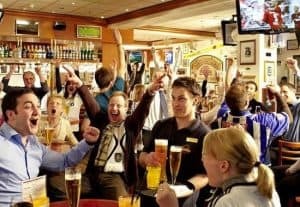 There are not many formal clubs for male expats in London, (opportunity knocks for a savvy expat) since The American Club closed during the 1980’s, but the best place to meet other Americans who have successfully completed their relocation to London is to join a sports club or head out to the gym. There are a number of sports clubs in London that focus on American sports – Baseball, Football and Basketball. Even if you’re not a player, you can enjoy the company of other male expats. The North American Connection offers a mentor program and may help with networking and business after your relocation to London and we’ve even heard of a group called STUDS (Spouses Traveling Under Duress Successfully). Being an accompanying spouse in London is tough no matter which one is the follower, so to speak. A successful relocation takes into account everyone’s needs, requirements and expectations. Choosing a home in an area that has amenities for the whole family, could make a big difference in your success.